This site discusses coordinate geometry. This page explains the distance formula, shows explains, and discusses common mistakes students make when using it. This page contains a gizmo exploring the distance formula. This page explains vectors and many different components of them. This page explains vectors and basic vector operations. This page states the slope formula and contains an example problem with a solution. NEW This page has links to lessons and practice problems about the slope of a line, spanning topics for this and the next lesson. NEW This page has links to lessons and practice problems about the slope of a line, spanning topics for this and the previous lesson. This page is a sample worksheet of problem for writing an equation of the line. 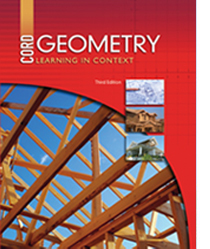 NEW This page discusses and provides practice with proofs in coordinate geometry. This page explains the Cartesian coordinate system using X, Y, and Z and how to find points in space.